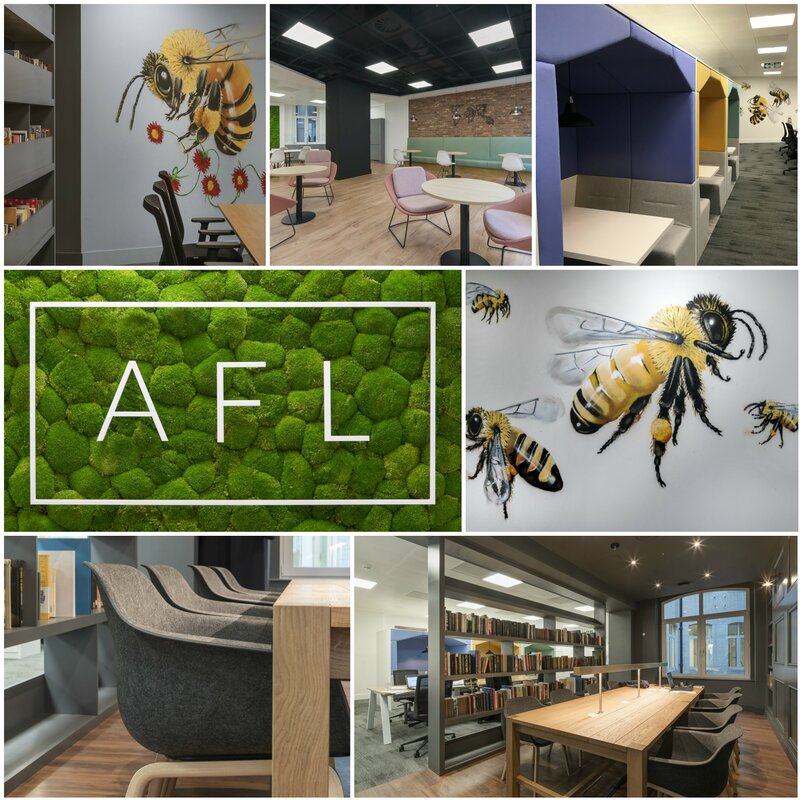 AFL’s recent office expansion saw our growing team occupy all of the second floor of 8 Lloyd’s Avenue, London, in addition to the space we already had on the ground floor. The innovative office expansion aimed to create a flexible, open working space for our own team as well as for insurtech start-ups to visit our Incubator unit and work alongside us in future. In fact, the excellent design team at Peldon Rose has featured this transformational project as a Case Study. We are building a unique, sustainable, insurance technology environment which truly benefits our startups (SUs), our core business, and the wider insurance market. Creating a real buzz are the bee murals by artist Louis Masai, reflecting our Manchester roots through the traditional Mancunian worker bee. And there is also a moss wall – a very tactile, green curiosity that is the first thing many visitors comment on when entering. A rolling stone gathers no moss, but can an evolving broker have a moss wall? Designed to promote agile working and encourage collaboration, there are a variety of work spaces on offer from more private meeting booths, to a quieter library area, to larger desks for team meetings. With abundant natural lighting, there is also a breakout kitchen and lounge area. Our new offices are a reflection of our drive to modernise the way the London market does business. We are creating a more nimble, adaptive and less predictable way of broking which is pushing boundaries both in its use of technology and its progressive working environment and culture. Ties are not required in here, there are no fixed phones, no fixed desks, and no fixed hours – you can rock up, open your laptop and work where you want. Our industry has been guilty of protectionism, in the past this has made it almost impossible for innovative minds from outside to break through and make a tangible difference. We’re here to change that. Valuable information is shared over here regarding unique insurance technology. The main motive behind AFL is to create hassle-free insurance policies.